Our philosophy “from the roots up” starts here. We try to buy directly from farmers or farm cooperatives, etc. to maximize the value for both ends of the chain, i.e., the grower and the consumer. Here we lay the foundations for relationships that would last for generations. By working directly with the growers, we are able to understand better their problems, and what we can change in our processes to maximize their returns and strengthen the grower community. This ties in with our philosophy of a strong and prosperous grower being the foundation of a strong and prosperous society. It is very important that the Indian farmer is made viable and not hurt by the ever increasing imports. More so, since he tills land that is intrinsically very fertile and the only source of the family’s livelihood. However, the farmer in India is in dire straits due to lack of transparent and fair marketing infrastructure in his direct neighbourhood. ndia is its villages. Raising the farmers GDP is raising the country’s GDP. A self reliant and prosperous farmer could more easily go in for crop improvements, food safety, water conservation, etc. We have, therefore, estabhlished an SDC (Strategic Distributuon Center) linked to thousands of famers in the midst of the apple growing area in The Himalayas, at village Matiana, 45 Kms ahead of Shimla, in the state of Himachal Pradesh, India. 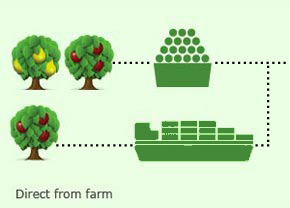 Due to this SDC, the farmer gets paid on the spot for 100% of the produce relieving him of all supply chain losses and thereby, increasing his GDP by a phenomenal estimated 40%. As India becomes prosperous and a more health focused population demands fruits year round, we are filling the demand gap by imports from around the world of fruits like apples, pears, kiwis, grapes, citrus, plums, pomegranates, etc. Currently, we are importing from USA, Chile, Peru, South Africa, Egypt, France, Italy, China, Australia, and New Zealand. We are one of the largest importers of fresh fruits into India, with 30 million pounds of imports as of 2012. Located strategically in the midst of growing areas, the SDC is primarily connected to farmers; ensuring the procurement of required quantity & quality of produce. SDCs receive the produce, wash, sort, grade, store, pack & ship to various locations pan-India including RDCs (for further local distribution in varying lot-sizes). Our first SDC, located at Village Matiana (45 Kms ahead of Shimla) is the tallest (with a building height of 154') and highest. Our first SDC, located at Village Matiana (45 Kms ahead of Shimla) is the tallest (with a building height of 154′) and highest pack house in the world (built at an altitude of 8,000 ft above sea level). Located in the midst of apple orchards with about 100,000 Ha of arable land in its catchment area, with a capacity 5,000 MT CA (Controlled Atmosphere) storage, it is designed to be scalable 10 times. It incorporates cutting edge technology from around the world including India’s most sophisticated sorting grading line imported from France. This ensures minimum damage to farmers’ produce, resulting in maximum and precise payments to farmers with the greatest possible transparency. Farmer Linkages: with farmer linkages dating from 1944, Dev Bhumi has built up relationships of trust through putting in the best technology and maximizing farmers’ GDP in a sustainable business model, whereby farmers have seen their net realizations increase by more than 40%. Whereas, hitherto, the farmer had to per force rely upon purchasers sitting in far flung markets and be dependent on a number of intermediaries in the chain, Dev Bhumi by creating this SDC has brought the market to the farmers’ doorsteps. With no intermediary, and on the spot payment not only are the farmers’ woes solved, but most importantly the farmer gets paid for 100% of his produce and is freed from the supply chain losses of the past. Located strategically in the midst of the F&V wholesale markets in metropolitan cities of India, an RDC is linked mainly to retail outlets as well as wholesalers serving second and third tier cities and markets. 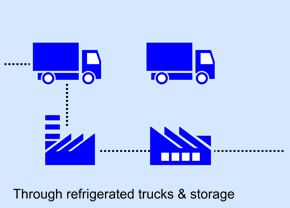 An RDC has specialized refrigerated storage capacities to cater to various needs of different products and ensure required temperature, humidity, gas compositions, and the avoidance of odour contamination, as well as receiving and shipping truck loads of varying volumes. The Dev Bhumi Head Office is located in our RDC in the Azadpur market of Delhi. The Azadpur market is the largest wholesale market of any kind in the world (with an estimated annual turnover of over 4 million tonnes). With our sales platforms being more than 10 times that of any competitor, we are the largest presence in this mega market. With 5,000 MT of storage space divided into 13 different chambers with dual use capacity of going from deep freeze to positive storage. With the establishment of one of the first cold storages in India in1944 where we had imported a ship load of cork from Portugal for the insulation and reciprocating compressors from M/s Tecumseh, USA, we have been upgrading constantly to our present state where our storage rooms have walls, ceilings, and columns of stainless steel or aluminium to impart the highest food grade environment with machineries ranging from glycol cooling, to the latest CFC free environment friendly DX gases. Cutting Edge Technology : we are employing technology used by NASA to grow wheat in space in cleaning our storage air of all pathogens, viruses, fungi, spores, moulds, etc. including the scrubbing of ethylene gas to ensure the odor and contamination free storage and maximum freshness & quality preservation. Fostering the future : in working as a Distribution Center for the nascent organised retail groups, we are putting in place the convenience of a platform from where organised retail could pick up F&V, with the minimum hassles and handling interventions. This also is encouraged by the link with SDCs which enable optimized truck loads of fresh produce to the market. Moving towards fully refrigerated trasnport, Dev Bhumi has started building its own fleet of reefer trucks. Even though most of the transport, as of now, remains out sourced, we encourage movement to the refrigerated model. In committees of the Government, Railways, etc. we continue to press for reefer containers being filled at farm or SDC level (even in the Himalayas), and then being unloaded in the market or RDC level (even in Chennai), and travel all this way by road or rail without ever once being handled manually or being unloaded and loaded on the way. This will ensure minimum damage to the fruit and be a step towards the integration of demand and supply in our vast country. This will also reduce dependence on the burgeoning imports and will fetch our farmers better year round prices while affording the final consumer even lower costs. The final link in our fully integrated cold chain is driven by our marketing and distribution network pan India. This is the most vibrant and dynamic section of our company. Because this section reprepresent the customer in our company, it becomes the most honoured input. 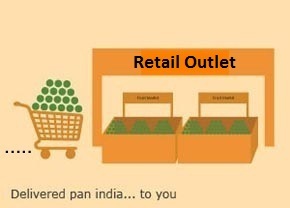 We continue to serve the unorganised retail along with the newly emerging organised retail, realising full well that the unorganised retail will continue to play a major role across the length and breadth of our nation, even while organised retail is a most welcome development. We hope to impart the learning from the organised. We continue to serve the unorganised retail along with the newly emerging organised retail, realising full well that the unorganised retail will continue to play a major role across the length and breadth of our nation, even while organised retail is a most welcome development. We hope to impart the learning from the organised retail to the unorganised sector also, in a bid to systemise and standardise the market, and comply with emerging food safety laws. We are proud to state: every single organised retail chain is our customer, and we continue to expand our volumes with them every year.